For me Christmas has always been an exciting time… Holidays, Shopping, Presents, Decorations, Christmas Carols, Summer, Swimming, Family gatherings. Amidst all the excitement I like to remember two things. Firstly, Christmas is the celebration of Jesus birth and secondly, for many folk Christmas is a distressing time, perhaps because of family rifts or the financial burden or extra work and social pressures. 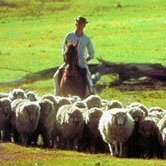 Squatter is all about sheep and that reminds me that it was shepherds, watching their flocks that were the first to receive the news of Jesus. Squatter is also about family entertainment, and has a wonderful way of teasing out conversations around the table. It is my belief and desire that these conversations build a platform for better communications and understanding in our families and community. As a gift idea Squatter is an excellent and economical choice, because it is suitable as a gift for the whole family.